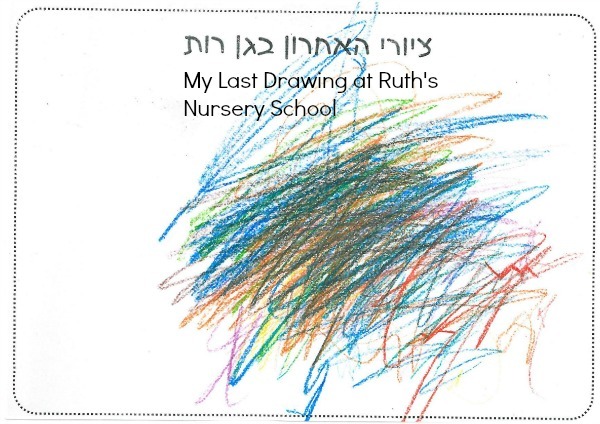 It really was an awesome idea from Yaakov’s exceptionally devoted, creative, and skilled teacher–Ganenet Ruth. What kind of teacher thinks to save each child’s first drawing on September 1st so that we parents can kvell over our child’s transition from scribbles to drawings of actual things and objects and living beings by the last day of Gan on July 3rd? But my Yaakov, it appears, started out the year scribbling, and has ended the year scribbling. 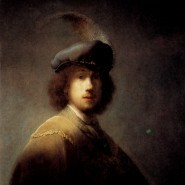 When I saw the pictures I thought– my Yaakov’s learned a lot at Gan Ruth this year, but he’s definitely no Rembrandt. Later that afternoon, though, I revisited those pictures. And I noticed something. Both drawings are scribbles. But the September 1st scribble is thin and spare and blahfully brown. And the July scribble? It’s dense and full and packed with bright colors. September is a low-muscle-tone mess. July packs an artistic punch. And looking at these scribbles, I was reminded of myself. I yearn to make the leap from distracted to focused. 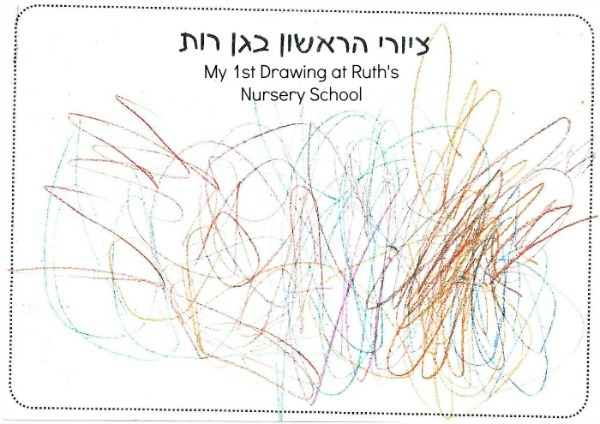 If Ganenet Ruth took candid camera footage of this JewishMOM on September 1st and July 3rd, you would see scribbles here as well as there. But take a deep look at my scribbles? And I promise that you will see the silent and subtle flowering of growth between the lines. I answered on Facebook. Your son seems very precise, but very artistic. His first drawing is very linear, lines going up vertically, but bending as he went along. His last drawing shows a strong repetition as he made individual lines into a solid mass. Children’s art says so much and these simple drawings do too. Please treasure them always. And treasure the gannenet who wisely gave them to the parents. chaya rivka, i agree with you. anyone can see that Yaakov has developed on so many levels.his colours are intense and bright. his lines are confident, strong and determined. morah ruth is a gifted teacher. I love your analogy. I also notice some smaller lines that look as if he is trying to write some letters. He is definitely growing and maturing as we all are. Can we mark our progress? If you ask yourself what would I have done in the past before I learned x or y? You would have your own indication of how you have improved. It is important to remember that even with growth we sometimes get startled into an old response pattern the trick is to catch ourselves sooner!